Otherwise (i.e. 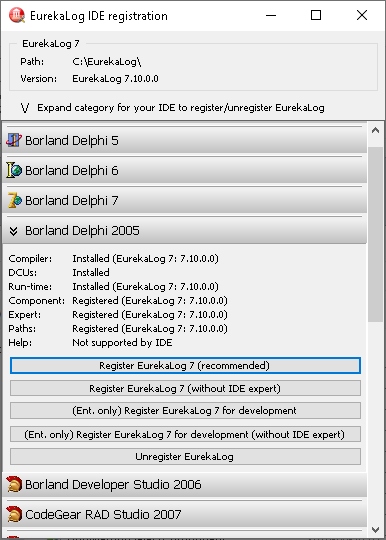 you're typical user, you want to install EurekaLog for classic Delphi/C++ Builder IDE) - continue reading. Download the latest version of EurekaLog from our site. • You can use trial version to evaluate EurekaLog. • If you've already bought EurekaLog - you can download your version from our area for the registered customers. 1. 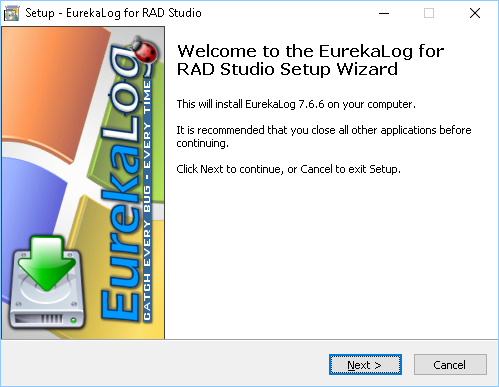 Before installing EurekaLog, you must close all Delphi/C++Builder/RAD Studio/AppMethod instances. 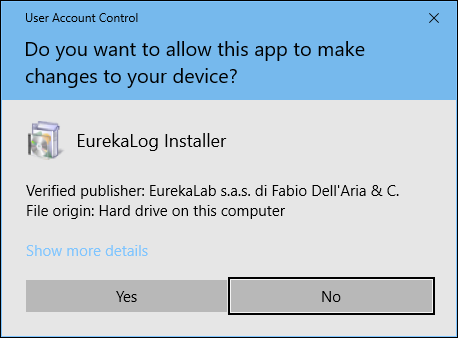 Note: installer will ask you to uninstall old EurekaLog versions before continue. 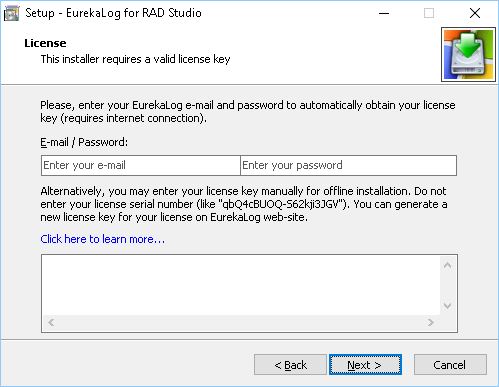 Please, refer to Supplying license for the installer. Once correct license is provided - you can continue. Installer will show you only available IDEs - based on your installed IDEs as written in system registry. You can check/uncheck appropriate checkboxes to install or don't install IDE support (set of .dcu files, .bpl, etc). There is individual set of .dcu/.obj/.hpp/.bpl files for each IDE. Don't see your IDE version? Source files (if available in your edition of EurekaLog) are installed by using separate checkbox "Source code" below. Source files are identical for all IDEs. There is only 1 set of files. 5. Follow installation wizard's steps until the installation will be complete. 7. 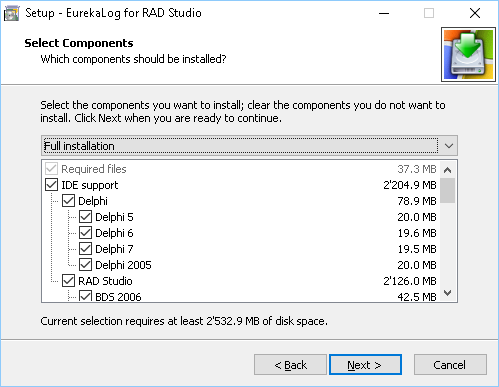 Run Delphi or C++ Builder and enable EurekaLog for some or all of your projects. 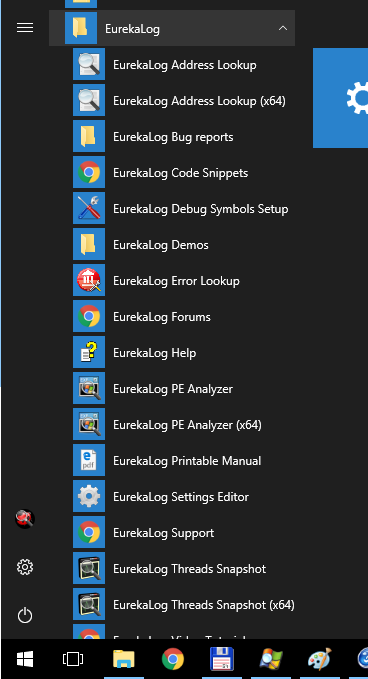 Note: you can use "Manage EurekaLog in IDEs" start menu item to enable/disable EurekaLog in particular IDEs after installing. Each installed and supported IDE will be present by roll-up category panel. You can expand category for each IDE by clicking on it. You'll see info about EurekaLog in this IDE and available options. • Where to find EurekaLog?